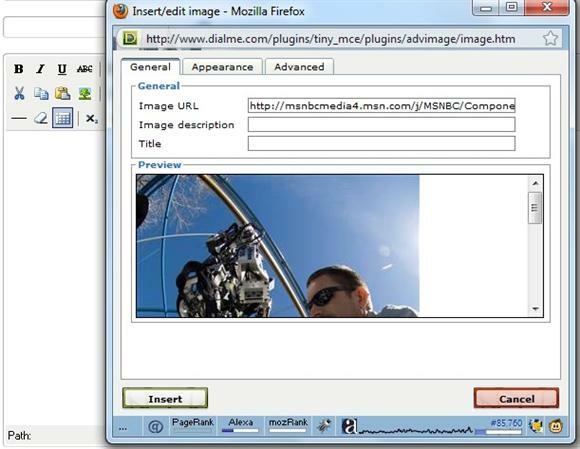 Allow members to upload images into blogs and other posts on your Dolphin website. 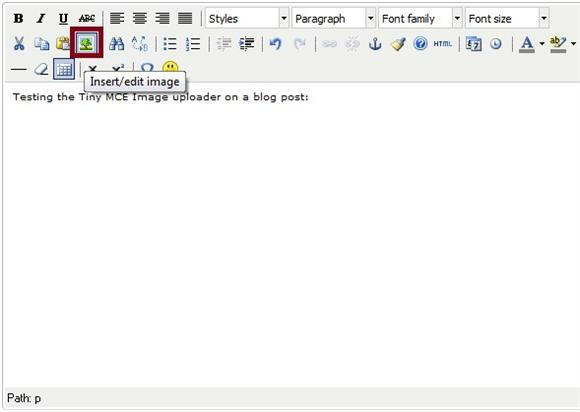 Many people and members get confused about how to actually add images to a blog post or any other post in Dolphin. 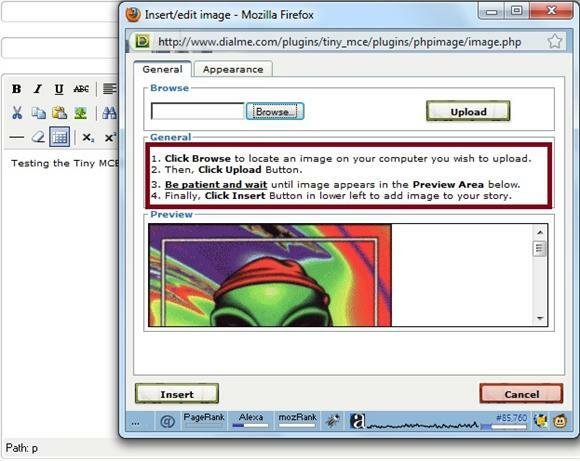 The standard add image feature requires that you link to an image with the full web address or location. This causes a lot of confusion for those that are not too familiar with this, and it makes things a little more time-consuming. Because of this many people don't bother adding pictures to posts. 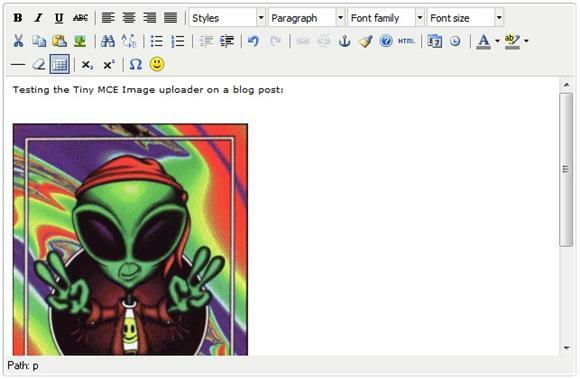 This Tiny Mce Editor plugin will allow your members to upload and add an image from their local computer, to a post fast and easy. I have tested this plugin with both Dolphin 6.1x and 7.0x. Both versions work great. There were some similar ones available in the past, but they weren't as simple to set up and use for both you the admin and your members. This one is very easy to setup and add to Dolphin 6.1x and Dolphin 7.0x. It only takes a few minutes. First download the file above from sourceforge.net. By default images that get uploaded will be stored in /uploads/images/. Note: You can change this location further down in this post if you wish. Don't change this unless you know what you are doing. Set the permission / chmod 777 or 755 depending on your hosts configuration for upload. You will then need to edit one Dolphin file /templates/base/scripts/BxBaseConfig.php so make a backup of the file before editing it. 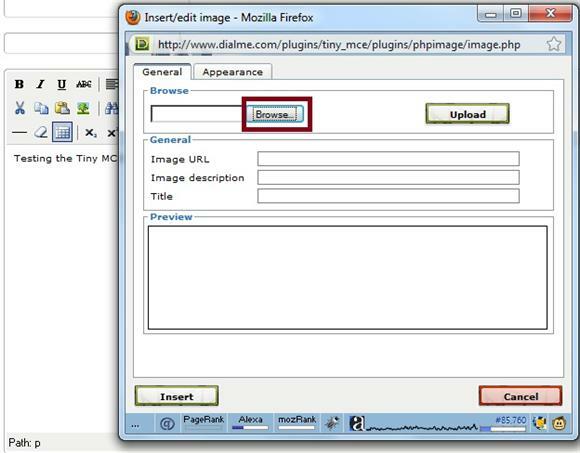 Then open /templates/base/scripts/BxBaseConfig.php and you will need to change the plugins: advimage to phpimage and image would become phpimage. There are several references for each of the tiny mce editors in this file so make sure you go through it thoroughly. 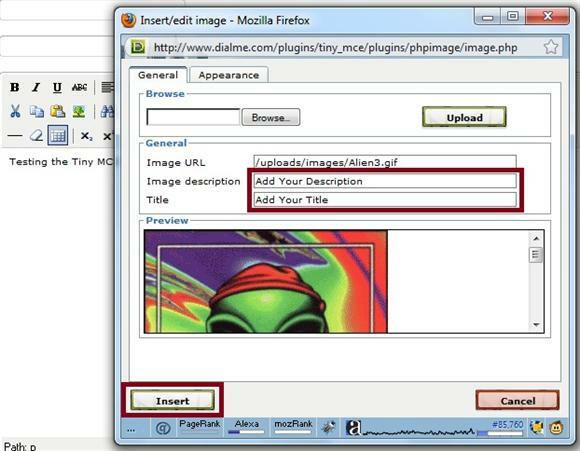 Continue going through the file for the other references changing advimage to phpimage and image to phpimage. Save the changes to BxBaseConfig.php back to your hosting account. Refresh your site a couple of times and try making a blog post. You might also need to clear dolphin 7 cache to see the changes. This will hide the original icon in the editor and only the new add image with the uploader is available for use. Now here is a screen shot with the new image uploader: click on Insert/edit image. Once I have selected an image on my local PC, I simply click the upload button and wait for it to upload. And now it is added to the blog. Where I can continue with the blog like normal, center the picture up, add more pictures, whatever. This final screen shot I modified the plugin slightly so people don't have to add an Image description or Title. I replaced this with instructions on how to upload and add an image. Anything you can do to help members figure things out is always a good idea. Not everyone is technical and understands how to do this. 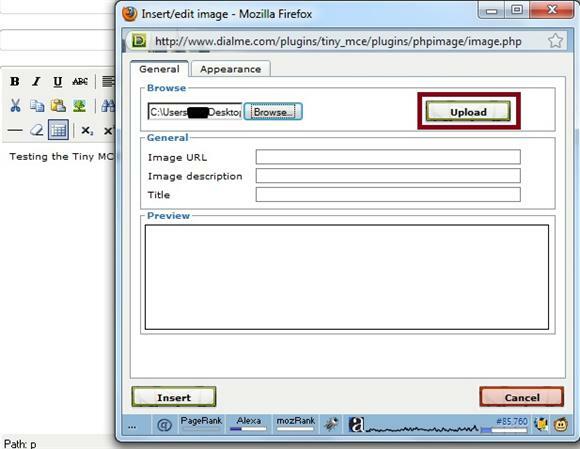 If you want to customize this plugin like this screen shot replace /plugins/tiny_mce/plugins/phpimage/image.php with this one that I have modified. If you want to customize it more open /image.php and make your changes. 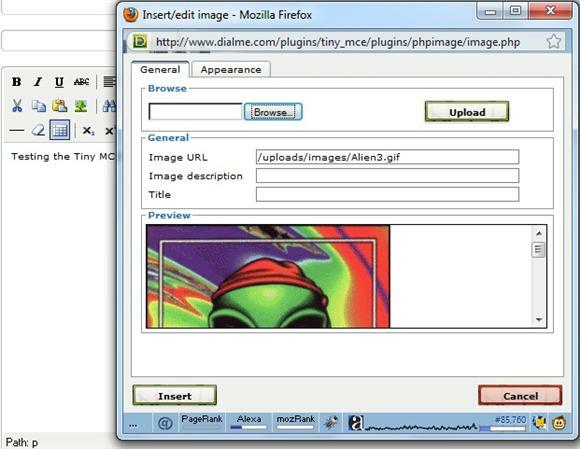 Download this modified /image.php file for phpimage plugin. 1. If you have a lot of members posting and using this feature you want to make sure your hosting account has enough space to handle it. 2. If your member gets confused they could be uploading the same image 2, 3, or more times. If this happens it will consume even more space. Images will take the form of image.jpg, and if they upload a second time by mistake you get another named image_1.jpg, image_2.jpg, etc. 3. If a member accidentally hits backspaces the image disappears. If they re-upload it again you will end up with 2 images. Sort of wasting a little space if this happens often. Make sure your members know how to use it could help. 4. Non members, bots, crawlers, etc. could still find these images by directly entering the address into a web browser. If you do not want guests viewing them, drop a .htaccess file into the location where they are uploaded to (/uploads/.htaccess or /uploads/images/.htaccess) with a deny from all or similar command if your wish to prevent this. Possibly add .htaccess in the uploads folder if you don't want non members, bots, or crawlers finding them. It is also set to resize an uploaded image to 400px. If you want to change this open the same file and near the bottom change the 400 to your desired size. You can customize image format types, add watermarking, and much more.